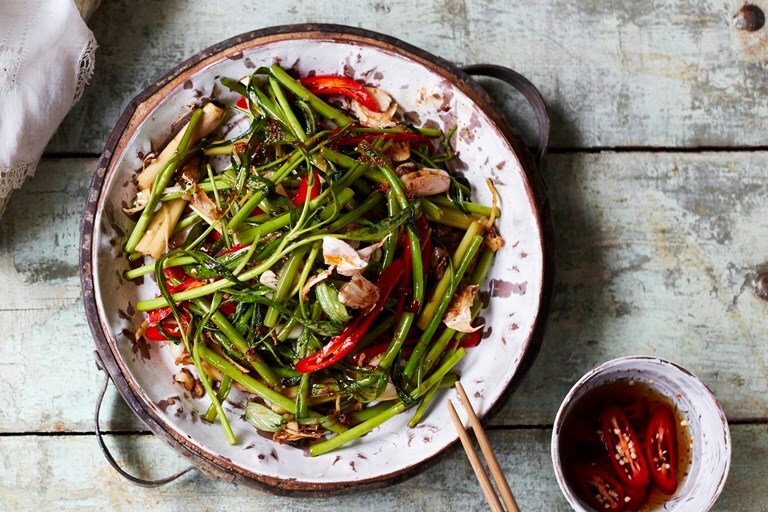 Thuy Pham serves up a vibrant Vietnamese morning glory stir-fry recipe, pairing this tender, vibrant Asian vegetable with flavours of lemongrass, garlic and chilli. If you can't get your hands on morning glory (you can often find it fresh in Asian supermarkets), you can use regular spinach instead, preferably a more mature spinach with stalks. We've included Thuy's recipes for crispy fried shallots and garlic – make a big batch as she does here and use in a plethora of dishes for up to a month. This recipe is taken from The Little Viet Kitchen by Thuy Diem Pham, published by Absolute Press. Photography © David Loftus. When I was growing up this was my mother’s go-to dish when she was in a fight against time with the daily errands and still wanted to squeeze in time to prepare a full Vietnamese family meal for when dad got home from a long day’s work. So, pull this one from your bag when you need a dish that takes minutes to make, but tastes like it took hours! Traditionally, this would be served with other dishes, and rice, and always with a little dish of soy sauce with some sliced chilli in. However, I would be perfectly happy serving this as a light and healthy lunch by itself.